LPA Excil Electronics provides a Contract Electronic Manufacturing Service (CEMS) including Electronic and Mechanical design. We are a UK company established in 1982 and have been part of the LPA Group since 2000. We aim to form long term partnerships with you, becoming your integral ‘Manufacturing Team’. Our experience in servicing high reliability requirements will provide you with a Manufacturing solution that results in your products being delivered on time, to specification at a competitive rate. Being part of your team we aim to be flexible and pro active, providing you with a service tailored to your needs. As your manufacturing partner we allow you the time to focus on your customers allowing us both to grow on the success of your products. Our highly experienced and fully trained operatives utilise a comprehensive range of pre-forming, placement and cropping machines. We also have Laser guided assembly stations for conventional components to allow quick and reliable placement. 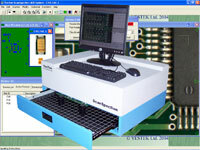 We have a fully automated Surface Mount assembly capability. The Pick and Place machine is designed for low to medium volumes that allow quick turnaround times between products whilst balancing the need for quick and accurate component placement. You will have access to a suite of testing facilities to complement your test strategy. More of our clients prefer to take the route of procuring a fully tested unit to guarantee confidence in their products and minimise disruption to their build programmes. We can conduct tests using an MDA or ATE to ensure your assemblies meet your test criteria. Our capabilities also include extended life testing (thermal burn in), PIC software placement and also design of bespoke functional test equipment. All of this allows us to supply you with a fully tested and reliable product. Your products will be manufactured under a Management System that is certified to ISO9001:2008. We operate an open door policy and welcome you clients to come and view your product being manufactured and to see our compliant facility or to come and independently audit our operations. Our internal training programme ensures our operators are fully skilled and trained to operate to IPC-610 Class 3. To allow traceability all of our assemblies are identified with a unique bar code.